A Money magazine reader asks ethicists Jeanne Fleming and Leonard Schwarz "Is there anything wrong with asking a good friend to secure the loan I'm giving him with the title to his car? Tom really needs the money, but he can be pretty irresponsible, and I don't want my $2,500 to become a gift." The ethicists get the first part right (Answer: In a word, No. And in two words, Absolutely Not.") but then offer some really bad follow-up advice: "Consider asking Tom to give you some collateral to hold until he repays you: a fine watch, say, or his prized Stratocaster -- something of sufficient value to give him a real incentive to pay off the loan. Because you're right: You don't want to bet $2,500 on the good intentions of an irresponsible friend." If Tom is so hard up for cash that he's trying to borrow $2,500 from a friend (most people borrowing cash from friends are borrowing it to stay afloat and make payments on other debt) and he has a watch worth anything close to $2,500, he should sell the freakin' watch. If he's so brain dead that he'd rather go into debt to a friend rather than sell a watch, you really don't want to lend money to him. 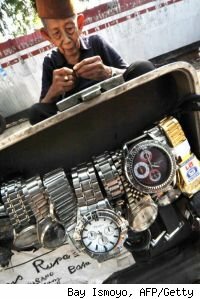 If his watch is so important to him that he'd rather hit up a friend for cash than sell it, are you really going to be prepared to sell it to make good on the debt? But the real reason that there is no way in hell he should make this loan is this: It won't really be helping. It will be enabling the friend to continue making bad choices. Here's another really good reason not to lend money to friend: You become your friend's creditor, meaning that you'll become part of the problem if his financial situation continues to deteriorate. Let them earn it. In this economy, a lot of people who are hitting friends and relatives up for cash are unemployed or underemployed, and just looking to put food on the table. Instead of becoming your friend's or relative's creditor, just give him some cash in exchange for some work. Maybe he can help you paint the house, landscape the backyard, or cook/go grocery shopping. If he has time on his hands, this is much more helpful than a loan because you're helping him dig out of a hole instead of adding to that hole with more debt. Make it a gift. If you can't afford to lose the money, you should be lending it to a friend -- according to a Money magazine poll, "43% of readers who lent to family or friends weren't paid back in full; 27% hadn't received a dime." A friend in need is a friend indeed, and there are tons of ways to help friends who are having financial problems without becoming their creditors. Be creative and ask yourself: "What can I do to make his life better without jeopardizing our friendship or my money?"